Last week was an interesting week for me. I had about a 24-hour span when I wasn’t sure if I had some sort of life-threatening illness. Not a whole lot of fun. I’m a pretty responsible person when it comes down to my health. I know I don’t eat right all the time, but considering I work for one of the best restaurants in town, I think limit my food intake pretty well. I exercise (obviously), don’t drink or smoke and have never done drugs. I go to my yearly exams like clockwork. I also don’t have a history of illness in my family. Longevity is common in my family, especially for the women. My Grandma Christine passed away at 96 last year, and my Grandma Helen just turned 96 last week and is still as active as ever. So I have to say that I was pretty surprised late last week when I received a letter in the mail stating that “further examination” was needed because a “spot” was found on a scan taken at my annual exam. (Sidebar – I got a LETTER? Really? A spot on a scan doesn’t warrant a phone call? Apparently not.) Now to me, this letter basically said, “you have cancer.” I tried to be calm and realistic, but I admit, I was inwardly panicking. I know this is a sport-related blog and I don’t want to get into the details of my anxiety so I’ll skip all that. Long story short - I was able to make an appointment for the next day (ok, I insisted I got an appointment). The more detailed scans came back clear and I’m fine. No cancer here! It was then I decided that I needed to lighten up on myself in terms of training. I know I have a tendency to be obsessive about things like exercise. If I have a workout on my schedule, it’s going to get done somehow – usually by getting up crazy early or staying up late. I rarely blow off workouts, and if I do – I make them up the next day. If I have a bad run in the morning, I feel the need to bike or swim later to make up for it. A dedicated personality trait is a good thing for an athlete, but I don't think an obsessive one is. I shouldn’t beat myself up because I don’t run as fast as I’d like or can’t swim as far as the training schedule says I should at this point. Exercise is supposed to be fun, right? I feel very fortunate that I’m healthy enough to train for this Half-Ironman and I’ve really enjoyed the training so far. But there are other things in life too. It’s finding the balance that will be my challenge. Sunday – 10 mile run with EN. I recently had to experience something that no female over the age of, let's face it, 25 years old should ever have to go through. Yes, thanks to this fun little sport I have taken up - triathlon, I had to go purchase a new bathing suit. Now I know that I ride bikes and that requires tight, funny-looking clothing. I also run, which for 8 months out of the year generally requires very little amounts of clothing - shorts and a t-shirt or tank top. I'm used to having my arms and legs exposed. And I'm generally OK with that. I mean, I have the same hang-ups about my body that most people have. I've always hated my legs... I inherited my father's genetics in that regard - short and stocky, especially my calves. These are the legs that inspired my Grandmother, upon seeing me as a teen to say "Boy - she'd got those Moczulewski legs, doesn't she?" These are also the legs motivated the high school track coach to ask me to shot put for the school team. SHOT PUT!! Not that there is anything wrong with shot put I guess, but it's not exactly something a high school girl dreams of being recruited to do. The funniest part about this is that I was wearing my cheerleading uniform at the time. Can you imagine? The shot putting cheerleader! Anyway, back to the swim suit. I probably haven't purchased a swim suit in at least 5 years, possibly 8. And those were more for sunbathing rather than swimming. I trained for my tri last year in a suit I'd had for years but had rarely worn. But that suit is now pretty threadbare and a little stretched out. It was definitely time for a new one. So down I went to Endurance Sports and Rec in Franklin. Deanna was kind enough to help me with sizes, since I was completely clueless as to what size I wore. I picked out a few suits by different manufacturers: Speedo, blueseventy and TYR, all one-pieces, and went into the dressing room. Ah - the cruel, dreaded dressing room - bright, unflattering lights, mirrors that show every flaw...not my exactly my idea of a fun place of spending an afternoon. But in I went. I tried on the first suit and almost gave up. I could barely get the stupid thing on! Fortunately, I figured out that I had accidentally picked up the wrong size. Once that was fixed, I tried again with somewhat better results. Kicker about racing suits though is that they're actually made for swimming and aerodynamics rather than cuteness. Sure, if you're an Olympic swimmer they might look cute, but one the average woman - not so much. Being short-legged, I need a higher-cut suit in the legs to make them seem longer. Unfortunately, none of these suits did that. They're also tight. I definitely felt like a sausage. A short-legged sausage. Sigh. I did finally decide on one. It's red and black, coincidentally the same color scheme as my bike, which is nice. I don't have to be all matchy-matchy, but I'm cool with things being coordinated. I'm still not thrilled with my legs in a swim suit, but I'll deal. Yes, these are the legs that were the bane of my existence in high school, but they are also the legs that have carried me successfully across the finish line of 8 half-marathons. I've enjoyed many hours of riding my bike with these legs. They're also the legs that were muscular enough to buffer against the impact of a car pinning them against a guardrail (the doctor said most shins would have shattered on impact). And they will, hopefully, be the legs that allow me to finish the Augusta Half-Ironman in September. Yesterday was my running group's (the fantastic East Nasty running group) last long run prior to the Country Music Half Marathon. The plan was to run 14 miles, most of which on the actual race course. Now, considering I hadn't run further than 5 miles since the Shamrock Half Marathon a few weeks back, I was a little concerned about the distance. I had also had decent bike / swim workout the day prior my legs were a little tired. But knowing I'd be running with Heidi, Rhonda and Polly, I figured I'd be OK. So we started out. All of us (the aforementioned Heidi, Rhonda and Polly) were planning on taking it easy and just getting through the run. Knowing how hot it was and how long we had to go, we started at a pretty conservative pace. I think, while we were hot, we were doing OK until we came upon the water cooler at the Roundabout near Music Row (that's a traffic circle for you Northerners). That water cooler had kind of been a carrot for me during the run - my reward of a little rest and some cold water. Knowing it was there, I had paced my drinking so I'd have an empty bottle to fill up. Problem was - someone had dumped out the water before we got there. (Sidebar - We're assuming that it wasn't someone in our group who dumped it, because that's really just not cool. Plus, we found out later the cooler had been stolen.) I can't tell you how mad we were the water had been dumped. By this time, it was at least 80 and would creep up to almost 90 throughout the day. We needed that water! So we slogged on. After about a mile, as if a mirage, we saw a table with some very nice women and a water cooler. Like angels from heaven, the employees from lululemon (a fabulous running/yoga store if you've never been there), were out manning a water stop for the East Nasty training run. I can't tell you how thankful we were to see them. Now properly rehydrated, we went along our merry way. Well, not so merrily actually, but we went along. By now it was hot. REALLY hot. And we weren't in much shade. We stopped at a Circle K to stock up on supplies (YAY for debit cards!!) and cool off a bit before facing the heat again. I'm thinking around mile 6 is when I felt my first heat-related chill. NOT a good sign and we weren't even half-way done yet. This was about the time when we hit Granny White Road. This is a tough section of the course as it's hilly. This is also where we started to walk. A lot. We started a plan of trying to run down the hills while walking up them. We've run worse hills, but yesterday Granny White just seemed endless. I have no doubt that if the weather was cooler, the hills would have been kinder. After another stop at a different convenience store and a pass past the lululemon water stop, we were finally on the home stretch. I know we were all pretty miserable by now. For me personally, I was just trying to figure out how to make it back without passing out. We walked more than ran the last 3 miles, but I didn't care. All I was focused on was getting back to Bongo Java and sitting in air-conditioning for a long, long while. I had never been more relieved to finish a run. Many thanks to Heidi, Polly, Rhonda, Julia, Sara and Chuck for "running" with me yesterday. And a HUGE thank you to the ladies from lululemon. They were truly lifesavers. I've always said that any day you get a new bike is a good day. Well, following in the tradition of me lucking into bikes that deserve way faster owners than I am, I had great day last week! 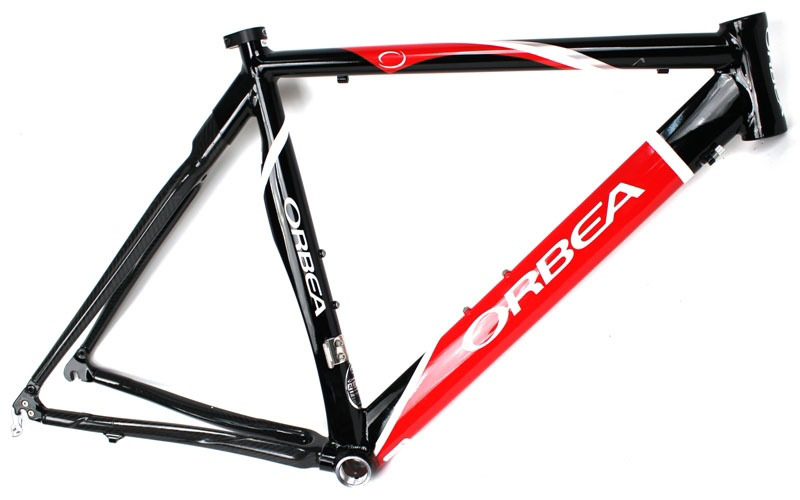 I am now the proud owner of an Orbea Alleta frame and fork, which will eventually be set up to be my tri bike. Yes, yes, I know. I've only done one tri so far and considering how awesome my road bike is, some might think I don't really need a tri bike. And I totally agree. But yet, here I am with a new addition to our bike stable. So how did I acquire this little gem? A little backstory - my boss at my day job has a son who races on the collegiate level. Back in 2006 my boss bought his son this Orbea to use as his time trial (TT) bike. Kicker is that very soon after this purchase, his son got a sponsorship deal from the Hincapie Development Cycling Team. Fun little benefit of getting a sponsorship from a major team like Hincapie - you also get a new bike. So the new Orbea TT bike that had only been ridden 4 times went into storage and sat there for 5 years. When I mentioned to Mike (the boss) that I started racing tris, and he thought about the bike. Wanting to clear out some space, he gave me a great deal on it. Then before you could say "bike hoarder," I owned a new bike! I don't have decent pictures of the actual frame and fork, but this is the model and paint job. Now what should be interesting, is that I know less about building up a tri bike than I do about triathlons. My goal is to have it built for the Augusta Half-Ironman at the end of September. Training update: my training took a little step backwards due to vacation and a Spring cold, but I'm back on track now. I have two tris in May - both sprints. My goal is to not embarrrass myself! 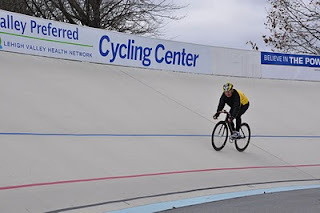 So I did something I'd never done before while I vacation - I rode on a velodrome. For those unfamiliar with a velodrome - it's a banked, oval bike track. 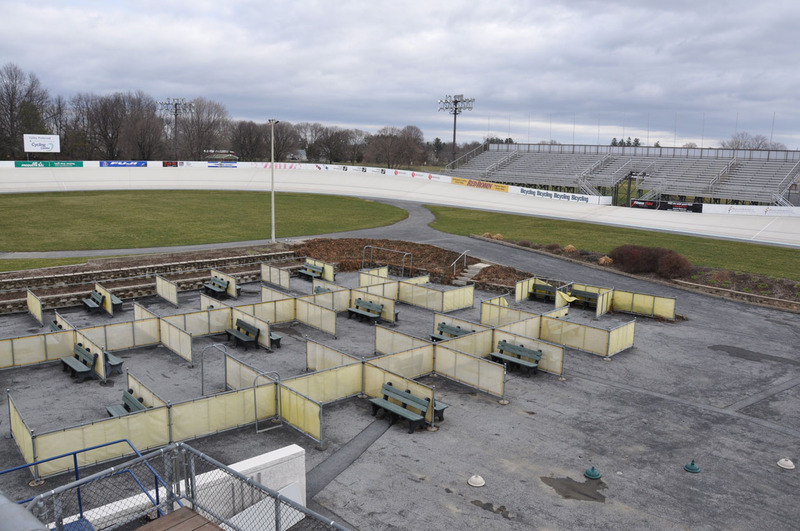 Think of a NASCAR track, but for bikes. 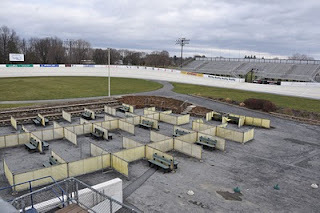 Being from a cycling family, I've been familiar with velodromes since childhood. 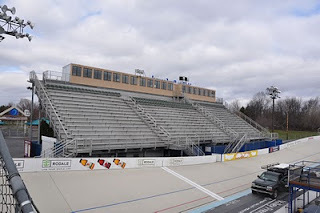 My dad grew up in Kenosha, Wisconsin, home of the oldest operating velodrome in the US (http://www.333m.com/). My dad and brother would sometimes ride on it when we would go visit, but I never did. Why? It's SCARY! Track bikes are different from standard road bikes in two distinct ways: 1) They have a fixed-gear, which means no freewheel and no coasting - you have a keep pedaling at all times. 2) No brakes. Yes, you heard me, no brakes. So if you're riding behind someone and they get squirrelly, you can't stop or even coast to slow down. Then take that bike and put it on a track with steep, banked turns...well, I think you can see why my childhood self wasn't so keen on trying it out. 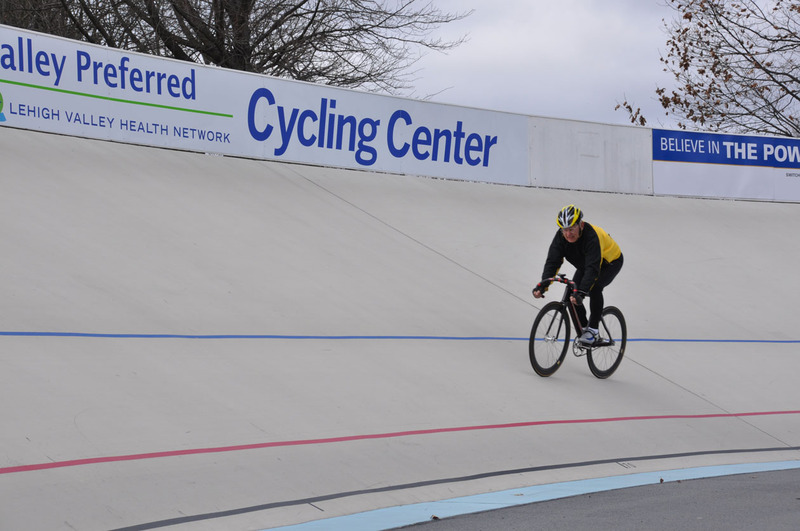 But my fear of velodromes kind of went away when I went to the Master's Track World Championships to watch my dad race last October. 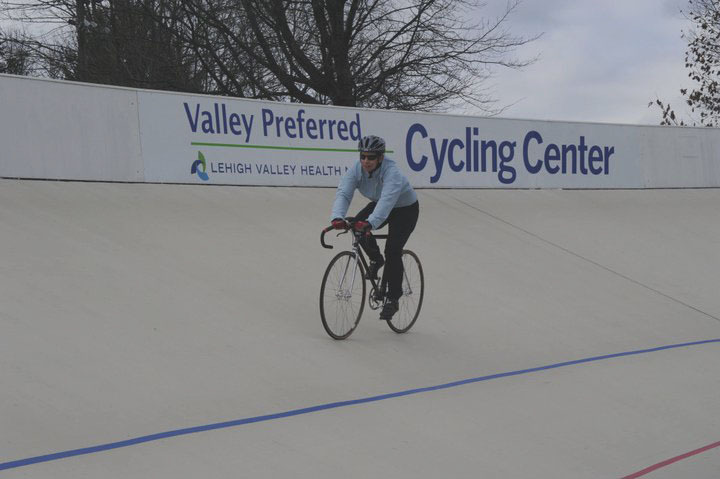 While still a little scary, riding on a velodrome looked really fun and I mentioned as much to my dad. 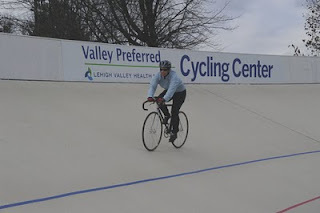 So when I was home visiting them last week, Dad and I took a little road-trip to Trexlertown, PA - home of the Valley Preferred Cycling Center and the closest velodrome to the DC-area (about 4 hours away). 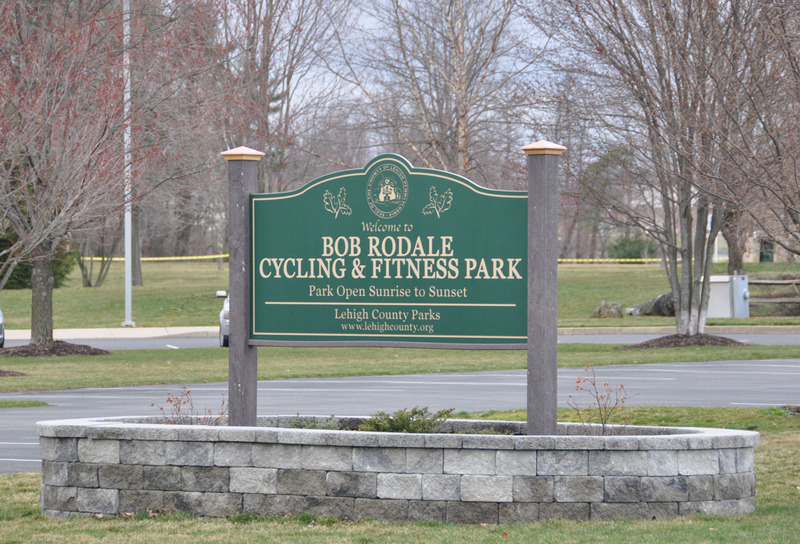 This velodrome has a cool history in that it was created by Bob Rodale, publisher of Bicycling Magazine. 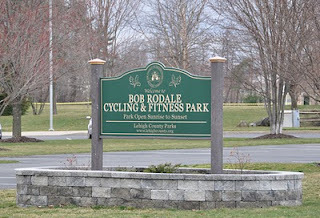 If you're a history / cycling geek like me, check out this link http://www.thevelodrome.com/about-us/history/ for a bit more about Bob and the history of the track. We arrived at the track around 10:00am. Being that it was a Tuesday, overcast and only about 50 degrees, my dad and I were the only riders at the track. Which was fine with me because the last thing I wanted to do was crash out another rider. 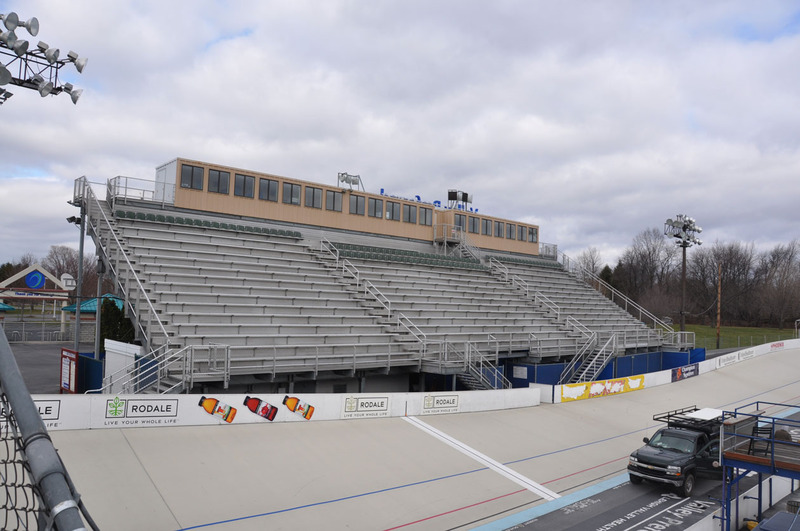 The first thing I noticed about the velodrome were the grandstands on both sides of the track. GRANDSTANDS! As in places where people can sit to watch bike races. Yes, the velodrome in Portugal had grandstands, but that's in Europe. The US hasn't embraced cycling as a spectator sport in over 100 years. On race day, all the riders set up in the pit area, which is in the middle of the velodrome. Here they can work on their bikes and warm-up before their races. After bundling-up against the cold, it was finally time to ride. Every track has a flat apron on the bottom of the track where riders can just cruise. I spent a few minutes there getting used to my dad's practice track bike, which I was riding for the day. As I stated previously, this was a fixed-gear bike, but since it was his practice bike- he had a rear brake on it. While I lose coolness points for having a brake, I was happy to have it as insurance that I wouldn't crash into something for the lack of being able to stop. There are three lines on the track: black, red and blue. While they mean something specific for races, I was only using them as a guide as to how high I was on the track. The higher you are, the steeper it is. When I first got on the track, I pretty much lived between the black and red lines, which isn't that steep at all. It's a freaky thing to have the road beneath you slant though. Takes some getting used to. I kept feeling like I was going to slide down the track. But slowly I started to creep closer to the red line, and finally past it. Then once I got comfortable there, I creeped closer to the blue line and finally got past it. I was surprised at how quickly I was able to adapt to riding on the track. I figured it'd take me several trips to the track to get me above the blue line. I eventually got up enough courage to ride up by the "rails" which is up at the very top of the track. Now THAT was scary. I just kept thinking "just keep pedaling, just keep pedaling" over and over while riding up there. I didn't know what was worse, the thought of sliding down the track or busting through the signage that lined the top of it. Fortunately, I didn't do either. I did want to try one thing while I was in Trexlertown. I'd seen racers in Portugal ride WAY up at the top, and then swoop down to the bottom of the track to pick up momentum. Now THAT looked fun. I figured since we were the only two in the track, I may as well try it. After making sure Dad wasn't anywhere near me, I rode up by the rails through the turn and then just flew down to the lower part of the track in the straightaway. It was so cool and very fast!! Unfortunately, it was then I forgot that I couldn't coast and jammed my legs when I stopped pedaling, but no biggie. I did the swoop maneuver a few more times before going home.